As a high school student in A.B. Davis High School in Mount Vernon, New York, I took two years of Spanish. Much of the second year was taken up with the complexities of the subjunctive tense, about which I never could gain mastery. As a result, my marks over four consecutive marking periods were 50, 55, 60, 65, until I took the New York Regents at the end of the year. The Regents Exam was the state- mandated exam that separated the men from the boys. If you passed the Regents with a good grade, the meant that you really knew your stuff. In the days leading up to the Regents, our teacher gave us periodic exams, which I usually failed. During one of the exams, I looked up from my desk and saw perhaps the brightest student in the class use a cheat sheet. While I struggled to pass, he took a short cut to success. His report card was filled with “A”s while mine had “F”s. I imagined a scary future: will he be doing this in medical school as well ? But then the Regents came and I got in the 90s because there were no subjunctive tense questions on the exam. The teacher thought I cheated but couldn’t prove it so he had to give me an “A” for the last report card period. The whole experience reminded me that honesty ultimately pays, if not immediately, then in the long run. Honesty is the heart of the matter in Shattered Glass. Shattered Glass is a story ostensibly about journalism and its commitment to truthful reportage. An early scene in the film depicts Stephen Glass, a successful journalist, sharing his wisdom with an avid group of high school students who may aspire to be writers one day. Glass’s presentation is warm, infectious, and devoid of egotism. He writes for The New Republic, the “in-flight magazine of Air Force One,” and tells his young fans that when you write for such an influential magazine, “your work gets read by people that matter.” Surely this is a heady job, but he cautions the students that reporters have to be responsible for what they write and there is more to the job than simply getting your own name into print. Journalism ultimately is about the pursuit of truth, and that is what makes it important. All this is preamble for an account of deception and lies. As the movie unfolds, we see Stephen fabricating story after story in a working environment where fact-checking is critical. Because he is an entertaining presence at staff meetings, he ingratiates himself with his fellow employees, who are unsuspecting of his ethics. When an internet magazine uncovers the deception, Stephen’s imaginary world falls apart. He has spun a web of lies from which he cannot extricate himself, and he begins blaming others instead of accepting responsibility for his actions. Shattered Glass is a powerful morality lesson depicting what transpires when we lack integrity, when there is no respect for truth. The Ethics of the Fathers tells us that one of the pillars upon which the world stands is truth (Avot 1:18). Without that essential element, societies cannot exist. The film also presents the consequences of losing a good name: loss of job, loss of credibility. Our Sages remind us that one’s good name is the most important possession we have. Rabbi Shimon says: “There are three crowns—the crown of Torah, the crown of priesthood, and the crown of kingship, but the crown of a good name surpasses them all (Avot 4:17).” Furthermore, we see how the pursuit of fame is ephemeral. The more one pursues it, the more it eludes him. Countless statements in the Talmud reinforce this notion: “He who seeks fame loses his reputation (Avot 1:13);” “A desire for honor removes a man from the world (Avot 4:28);” “Do not desire honor (Avot 6:5).” Finally, the Talmud explicitly tells us that we should always attribute the source when we quote another’s statement: “Whoever reports a saying in the name of its originator brings deliverance to the world, as it says, And Esther told the king in the name of Mordechai (Megillah 15a). Finally Shattered Glass provides an example of the adage in The Ethics of the Fathers that tells us “Whoever desecrates the Name of Heaven in secret, they will exact punishment from him in public (Avot 4:5).” Stephen Glass is a liar, a distorter of truth in order to promote his own image. 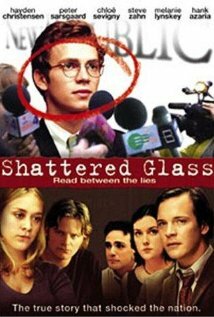 In the end, his deception is revealed in a public way, not only in the news media but in the film that is cleverly titled Shattered Glass.